The following public programs organized by Masjid Gifu is open for everyone interested. 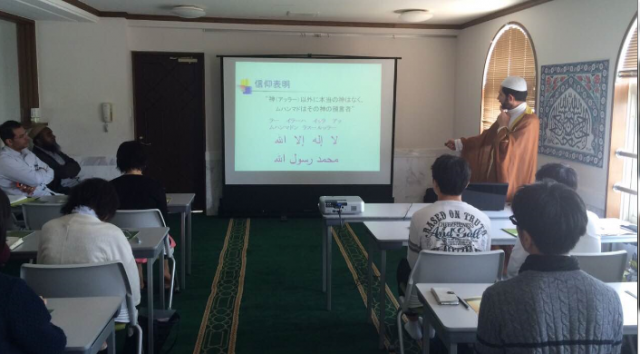 Abdulkader Obari from Masjid Gifu/ Muslim Culture Center will be in charge of all programs. He is a Syrian brother fluent in Japanese. You are more than welcome to join us. Jan. 28th (Sun) (Women only) Let’s cook and eat the Halal cuisine of Pakistan! Feb. 25th (Sun) Sunni and Shia. How is it related to the conflicts? * Course contents of 2016, and comments from the participants can be viewed here. * Lunch is prepared after each course. Please feel free to join us. * To participate in a course, please apply via e-mail or phone by the 22nd of each month. Term 3 (December ~ March) Reading Arabic sentences / Learning phrases useful when traveling abroad, etc. * To participate in the course, please apply via e-mail or phone. Feel free to ask us for more details.